Lea Omana Natera, 62, of Hermiston, Washington, died peacefully on January 19, 2019 with her loving family by her side at Richland, Washington’s Kadlec Medical Center. She was survived by her devoted husband of 33 years, Aniceto, children Anthony Raymond, Lea Anne with husband Marc Leonard, and Evangeline Marie. A graduate of Manila’s Far Eastern University College of Nursing, she worked as Registered Nurse in various hospital around the United States where her husband, a former career Navyman was stationed. She was born on March 21, 1956 in Gumaca, Quezon where she finished her elementary and secondary education. She was the ninth among the ten children of Ramon Barretto Omana Sr. and Consorcia Train ( both deceased). 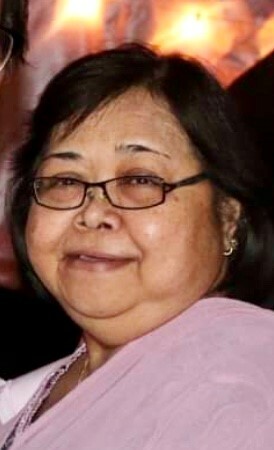 Her siblings include Rosario Omana Ranjo, Veneranda Omana Gamayon, Ramon Train Omana Jr ( deceased), Clarita Omana Almojano, Lucilita Omana Eroa, Alex Abs Omana, Dario Train Omana, Fr. Max B. T. Omana and Victoria Omana Blauvelt . A devoted homemaker when she was not busy with her nursing job at Kadlec Medical Center in Richland, Lea found so much pleasure in sewing, gardening and cooking. Hers was a gentle soul, reserved but friendly, a dependable professional and the nicest kind of person one wants to be around. Wa 98118 on Saturday, January 26, 2019 at 10:00 a.m.
Interment will be at Calvary Catholic Cemetery immediately following the funeral service.